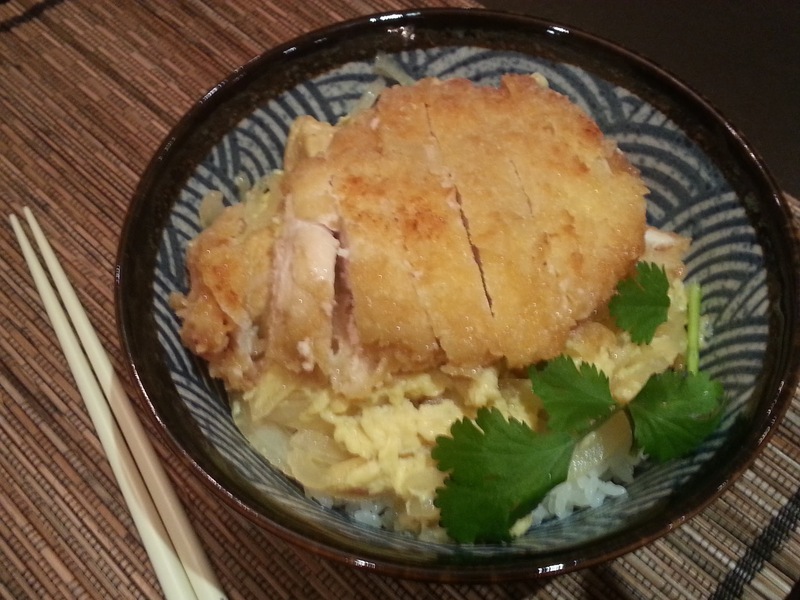 I attempted Chicken Cutlet Donburi at Ashley’s request last weekend. Turns out that this is a really easy dish to make. I always wondered how the layer of onions and fluffy egg is made to taste so delicious? The secret is in the broth used to cook them! I stopped by the Japanese supermarket and picked up the key ingredients: sake, dashi, and mirin. I am off to a good start! Dredge the chicken breasts in flour, beaten egg, and then panko. Heat oil in wok over medium high heat and pan fry the chicken breasts until the crust is golden and crispy. Transfer to a plate lined with paper towel and set aside. Pour remaining oil into a bowl (oil can be reused for other dishes) and wipe the wok clean with paper towel. Prepare the dashi stock according to the package instruction. The dashi that I purchased has instructions to mix one packet of dashi with 3 cups of water. This recipe only requires 1 cup of dashi stock. Save the remaining dashi stock for another dish. Boil the sliced onion, sake, mirin, soy sauce, sugar, and dashi stock in the cleaned work over medium high heat until the onion is tender. Place the fried chicken breast in the middle of the wok over the onions and dashi stock. Add beaten egg into the boiling stock in a slow stream. Note: I have 2 cups of left over dashi stock and made Oyakodon the next day.